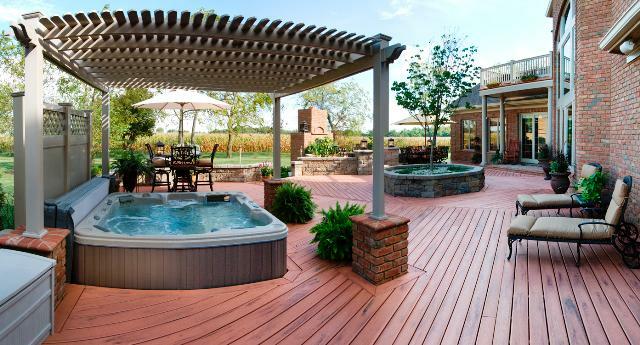 Don’t underestimate the power of color when designing your Columbus, OH deck. There is more to choosing the perfect color palette for your new deck or outdoor space than meets the eye. Archadeck of Columbus emphasizes the importance of choosing the right color in order to get the most enjoyment from your space. 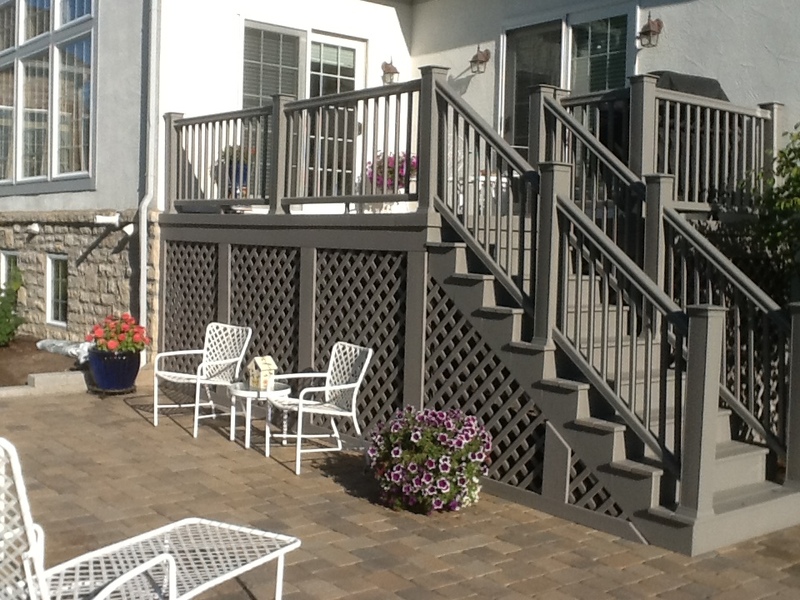 This deck is built using TimberTech decking in the Sandridge color. Not only does the color choice work with the colors of the home beautifully, it stays cooler because it is a lighter color. This is a good color if your deck faces south or west and receives a good deal of sun. Color is an amazing thing. Not only does color effect our visual perception of an object or space, it can also affect our mood and even our health. Choosing the right color or combination of colors, for your deck or outdoor space is important. Many times so much thought is put into the shape, size and location of your deck that choosing the color seems like an afterthought. Choosing the right hue can impact not only how you view your outdoor space, it can also impact the amount of enjoyment you get out of your structure as well. 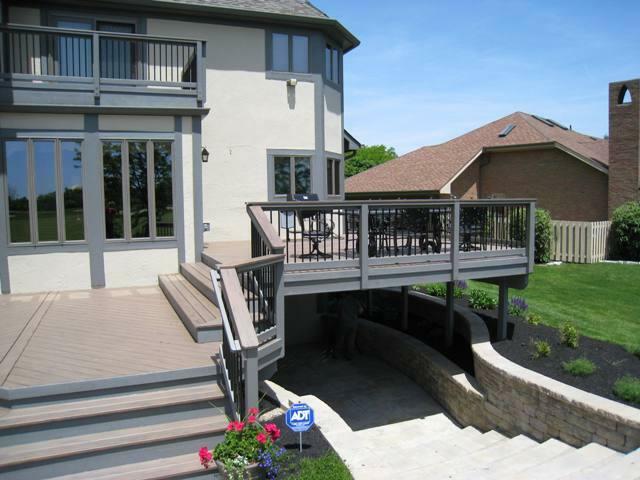 River Rock is a TimberTech color which appeals to homeowners looking for a gray or taupe color for their deck. Once you have chosen a contractor for your outdoor structure, hopefully they have helped provide suggestions on color choices. I know not having the tools and knowledge available to make an informed color choice can become frustrating. My wife and I are in the process of selecting colors for our new interior carpet and the miniscule 1 x 1 samples on carpet boards make it difficult to make a solid choice. Much can be said with other aspects of color selections within the interior and exterior of your home. Who invented those tiny paint chips anyway? In this business, when it comes to decking materials, synthetics are a great product. Unfortunately, many synthetics offer only a limited number of color choices. Even though the biggest and best names such as AZEK and TimberTech introduce new color selections each year, they are still limited to maybe 8-12 choices at any given time. This makes choosing the right color a little more complicated. In order to get the most out of your outdoor investment we recommend taking certain factors into consideration when making your color selection. This TimberTech Earthwoods deck combines contrast through the white railings, and the decking color compliments the home but is not an exact match. Orientation of the sun should play a key role in the material you choose to finish your deck or outdoor space in as well as the color. What direction does your back yard face? If it faces the south or west then you won’t get a lot of shade. Since synthetic decking materials like composites and darker colors retain more heat a lighter hue may make your best choice. This is especially true if you enjoy going barefoot on your deck. Choosing a lighter color composite or choosing to build with a natural wood medium will help keep those toes cooler. Studies have shown that composites retain more heat than wood because they are denser. Wood is a naturally good insulator and breathes unlike a synthetic. This enables the surface to stay cooler and hold less heat. This may not factor into your color or material choice as a make-or-break issue, but if you live in a warmer part of the country shaving a few degrees off the outdoor temperature can make a big difference. Contrast can be breathtaking. 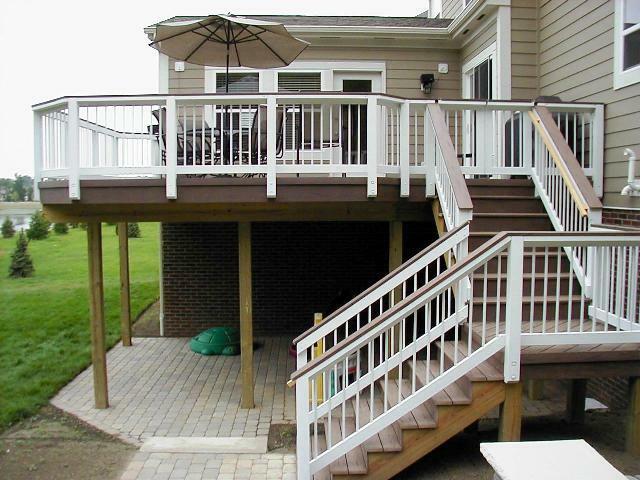 This decking is a complete contrast to the home, but was designed with matching rails. When it comes to selecting colors, one idea is to bring in the colors that surround your planned outdoor space. What is the color scheme of your house? Even though you likely won’t be able to achieve an exact match to your home’s color, you will be able to get fairly close. Maybe consider choosing a lighter shade with the same base tint as your home’s exterior. Or choose a darker shade for an elegant color scheme. This falls into a complimentary color scheme and can deliver a well-rounded approach to choosing a color. If you want to match your decking color with your home you can do so by picking up the colors on different areas of your deck. For example, if you install a wood rail you may stain it match the color of your home. This would create a scenario where the decking surface differs from the rail and adds contrast which is also good. If you plan to build an outdoor living combination such as a deck and patio combination make sure to pick your decking color first. It is easier to match your hardscape or paver colors to the deck than the other way around. 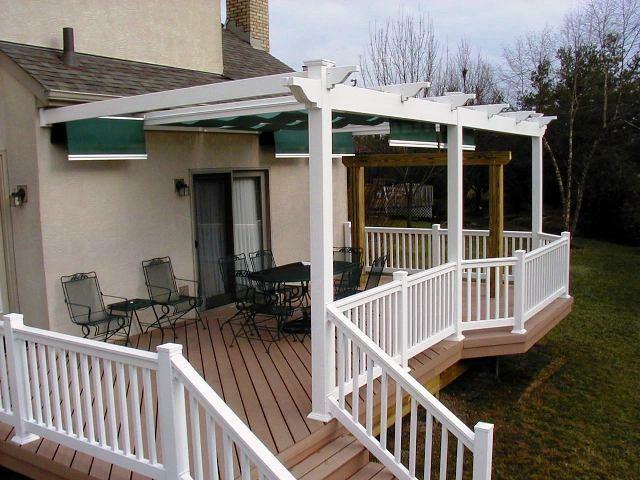 This white vinyl pergola works in unison with a TimberTech composite deck in Cedar with white vinyl railings, and the home which is stucco. Many of the synthetic decking websites have valuable color selecting tools that will aid in choosing your perfect color. TimberTech provides a TimberTech color visualizer on their website that actually enables you to build a virtual custom deck. You have the ability to change the colors on the rails, balusters, posts and many other details to try each hue on for size. On the AZEK website there is a vast AZEK gallery of photos that has a plethora of examples of their colors and how they look in different scenarios and combinations from railing to trim. We’d love to provide suggestions and guidance from our experience. We have the knowledge of what is hot in terms of colors on the market, and what is not. Our personal favorite is Pacific Teak from TimberTech’s Earthwood line. Reddish tones are not popular in the Columbus area, and gray is making somewhat of a comeback especially with homeowners who have a gray home. This color combination is truly a match made in heaven. We provide many references and we highly encourage people to look at recent jobs we’ve completed to see what the decking looks like in “real-time”. Even if you feel comfortable with your builder, it is always a good idea to go and see real-life examples of their work. 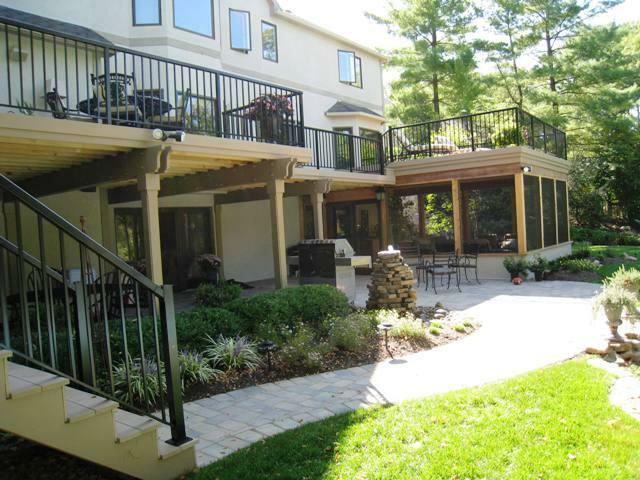 Contact Archadeck of Columbus to help you plan, design and build your perfect outdoor space. We can assist you with every aspect of the design and construction of your deck including choosing the hue that best suits you! To see more successful decking color combinations visit our composite and vinyl deck gallery, our wood deck gallery and our decks gallery located on our website. Previous Previous post: When is the best time of the year to build my Columbus, OH deck?